“The Red Rose Trail – 100 miles of varied country walking around North Lancashire” – so states the front cover of John Rowe’s 2013 book, and we were privileged to have his company on this first stage, from Lancaster to Garstang. I asked the author what inspired him to devise the route and he said it came about as a result of walking with a friend who had done something similar in Warwickshire. So he set about putting together a route that could be split into stages with accommodation at the end of each day, and the option of pubs and cafes along the way. The overview map shows the route heading south from Lancaster then passing through Garstang, Chipping, Whitewell, Waddington, Slaidburn, Wray, Burrow, Kirkby Lonsdale, Tewitfield, Silverdale, and Morecambe before returning to Lancaster. The section which the merry band of 25 people covered was delightful and started in the shadow of Lancaster Castle, then passed the historic waterfront buildings along West Quay by the Lune, following the Breath of Fresh Air route on to Conder Green for our first break. Here the admiring throng paused to pay homage to the photo of our great leader, Norman, displayed on the information board on the side of the public conveniences. He received all plaudits in his usual modest style. I must mention our additional celebrity guest, Dianne from Ontario, aka Kath’s cousin, who loved every minute of the walk (and the company – she’s obviously very tolerant! ), and even had a go at a bit of dry stone walling en route! She, like the rest of us, was thrilled with the extensive carpets of bluebells and wild garlic which really were at their best. Progressing along the Lancaster canal, we then left the canal and struck out to Upper Thurnham before following field paths and lanes to Cockerham. More field paths and a footbridge took us over the River Cocker, and lunch was had by the starving masses before they had chance to rebel. Picking up the Wyre Way we headed to Scorton where we succumbed to the pleasures of the flesh and indulged in wonderful locally made ice cream, all the more enjoyable for me as Norman bought mine (really!). Then it was on along the Wyre Way into Garstang where, after the celebrity book signing had taken place, a welcome pint was had by some. Oh, and of course there was the usual GPS mileage comparisons, with the general consensus being 18 miles. Many thanks to Norman, Chris and Ian for organising the walk, and of course to John for devising it in the first place. I have put the mileage down for this walk as 19.6 mls which Ralph and Dave confirmed on their GPS’s. I haven’t put the total amount of ascent down. Put it this way – I remember going up a lot of steep hills but I don’t remember going down any! It was an Andy Dobney optical illusion. Darren Brown would have been gobsmacked. We spent eight hours continually climbing and yet finished up where we started! Truly mindboggling! Joking apart this was yet again a stunner of a walk. We were all blown away by it when he put it on 18 months ago which is why we asked for a rerun. He didn’t disappoint and we all enjoyed it. For the purists here is the route. The walk starts at Clay House, the 16th century historical start of Calderdale Way. All the following sentences should be prefixed by the word “up” but for the sake of brevity I’ll omit it. For goodness sake we were even convinced the canal ran uphill! Through the woods to Copley and over the river onto Route 69 cycle trail, along the canal section to Halifax. We followed the short Hebble Trail to the edge of town, along the road section to Trooper Lane, a cobbled hill, with a steep ascent over a short distance onto Beacon Hill, overlooking all of Halifax. Here we had a short well-deserved break. Keeping Shibden Valley to our left, we went down (I don’t remember this bit) the Medieval packhorse track, linking Wakefield to the town, and next stop was Southowram Church for a morning break. Continuing through old ways on to School Lane, then left and passed the cricket club, into the beautiful, bluebell-filled Park Road woods. Following Plains Lane, over Elland Bridge, into West Vale, and back to the starting point for lunch - 20 minutes before the cafe closed. Phew!! Loop One of eleven miles done. Everybody was up for the second loop!! Passing Karen’s house and Chez Dobney, we went up Hullenedge, the old pack horse route, to cross over the M62. Avoiding the temptation of Wappy Spring Pub, under M62 again, up the old bridal way then through ancient trade routes to Thunnerly Woods, over to the tops and down through fields to Stainland. Here was another well-earned short break. The trek to “home” was along the golf course edge and through fields to Holywell Green, passing the deer farm, up a few steps topping out at 16the century village, Jagger Green. We started from Endmoor tennis club, heading north to Birkrigg Park and then west to Halfpenny and north again over The Helm, which give us views over Kendal and Morecambe Bay. We then dropped down into Oxenholme, stopping off at the railway station for a quick drink. On we pressed to the village of Natland. After lunch seated round the village green, we had a peek into the church - the last time I led this walk in 2010 they where fitting new stained glass windows. We headed down the River Kent to Sedgwick and the impressive hall. From here we traced the line of the old Lancaster/Kendal Canal from where it is now submerged by pastureland to where it is still a canal and is crossed by the Westmorland Way. Arriving back at the start via Stainton we are then went of to the Crooklands Hotel for a well earned drink. Despite atrocious weather, eighteen walkers set off from Grasmere village to walk the 15 miles to Keswick. Leaving the village, we walked up Far Easedale before climbing out of the valley to reach Greenup Edge. Here, the weather took a turn for the worse with torrential rain and 40mph winds. Despite this, we plodded on, ascending the rarely walked Ullscarf. After the summit, we quickly desended, taking a quick 10 minute lunch break beneath a sheltering rockface. We then crossed 2 miles of wetland before decending to the hamlet of Watendlath. Sadly, the cafe was closed, so we carried on to Ashness Bridge before making the final ascent to Walla Crag. As we came into Keswick, the rain finally stopped, the clouds parted and the sun shone to give us the glorious views denied us all day. Ah well, that`s the `joy` of walking. 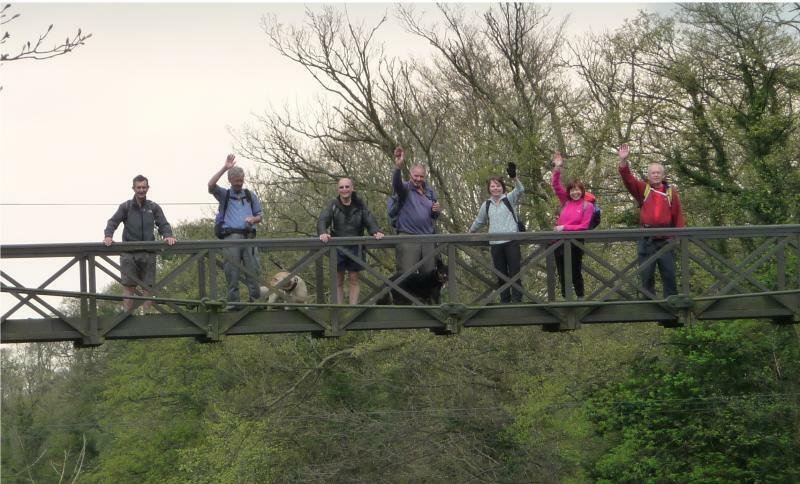 The glorious weather of Tuesday had disappeared as 20 pilgrims and 3 dogs met on the banks of the Ribble at Preston. At least 5 apologies for holiday commitments etc had been received so I was surprised by the turnout. Colin arrived from Telford again and Bonnie and Clive came from Glossop; long distance pilgrims! We set off into a bitterly cold wind and were glad to reach the comparative shelter of the cycle Guild Wheel track after a mile or so. Still following the river we came to Brockholes Nature reserve where our able back marker Norman guided most people into the visitor centre for morning break. The dogs and owners had to stay on the public footpath but we found a nice picnic table on the childrens playground. Some walkers tried out the zipwire on their re-joining - I missed a good photo opportunity! Leaving the river plain it was a stiff climb up to Red Scar woods and then round by the crem and industrial units to reach the parking spot for the next leg of the Monastic Way. Passing along some major roads it was good to leave the traffic and make our way by field and track to Ladywelle. The approach to the well is a genuine Pilgrims Track and indeed there were plenty of other people at the well on this April day. Most had come by car though! Lunch was taken in the grounds giving people a good chance to look round. I think all found it very interesting. We left the Monastic Way here and started our return journey which was to take us through the centre of Preston. I am a Proud Prestonian by birth and on the way back we passed where I was born, lived, married, educated etc etc. Very Boring for those near me as I kept pointing out the various places. We walked through Preston Golf Club with a glorious sweep of grass ready for the new season, through Sharoe Green and onto Moor Park. Here we paused to look at the football ground with its image of Tom Finney and an observatory which was named after Jeremiah Horrocks (see Monastic Way Part 3) Coincidentally on the way home Chris heard a report on Radio Lancashire that there is to be a new £3000 transit weather vane put onto the Church at Much Hoole where he was curate. Jeremiah may be long gone but he is certainly not forgotten. Returning to Preston, I had asked Norman to bring his Union Jack flag from our Somme encounter so that I could hold it high as we went through the town centre in the manner of tour guides. We attracted many stares and quite a few comments as we trooped past the markets, Harris museum, Marks and Spencer etc etc. Anyway, I wasn't arrested (I think some thought we were the BNP or something but the Army recruiting van was appreciative) and we counted everybody back in as we turned into the green oasis of Winckley Square. Onto Avenham Park and a short drinks stop in this lovely park. Some looked at the Japanese gardens, they missed the chocolate bars on offer! Walking through Miller Park we cut down to the Ribble at the point where we left the Monastic Way on the last leg. The final mile or so was on the Monastic Way alongside the River Ribble back to the cars. We saw the 2 parks from a different angle but they both looked lovely with the spring flowers in bloom. A few pilgrims came into the pub for a drink. GPS mileage varied on this leg from 14.2 to 15.1 miles, take your pick on that. Thank you to Norman for his back marking and see you all in June!